Two very similar but very different mages. Should be old news to most of you by now. But as I've tried to build decks using each of them, I've come to a realization. These two mages have their skills mixed up! Now, a few of you are probably going to disagree with me, and just say "just build them right" or something. And that's fine. But I've got pretty good instincts, and those instincts built two decks, one for each, that shows just how much better these two could have been. Here's how I would have mixed their skills. I'll explain why afterward. Now you're probably going, "why? ", and to that I have a few simple things to point out. Fast can't help an archer. Yes, being able to take 2 moves and an action is amazing. But not when to shoot a bow you need to spend a Full action. "But wait, why not use Kajarah so you can still attack?" Because it's got a range of 0-1. If you're an ARCHER (and it's clearly called Archery Skill, AND she has a bow in her picture, or at least arrows), you want to be further away than that. Every bow in the game is 1-2, but takes a full action to use. This is directly counter to the abilities of the Mage though, making Fast semi-useless. 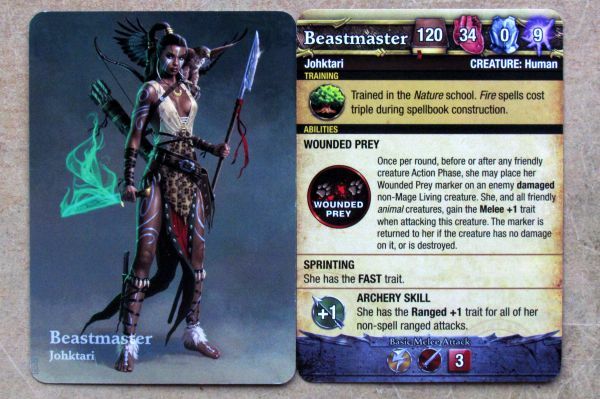 These new versions of the Beastmasters have the ability to take full advantage of their skills. A melee attacker can get in, hit hard, and disengage if needed thanks to Fast + Mongoose. Pet allows you to have a partner to also hit hard, bringing in a big creature to deal with the enemy while you pull back, heal, then re-engage. The new Johktari, on the other hand, can constantly spam little creatures on it's quick cast while shooting at the enemy with it's bow. The Wounded Prey ability allows it to maximize the power of those little creatures, turning each one into a much bigger threat, and allowing you to deal with enemy creatures easier. I honestly feel this creates a better symmetry between their skills and creates more solid mages than they are now. Let me know what you think! EDIT: The Health would be swapped between them too, as obviously the melee fighter needs the Health more than the archer. EDIT2: As pointed out in the post right below this, simply swapping Sprinting and Quick Summon does the same thing, rather than swapping 4 skills around XD Fixed this in the main post, and tweaked things to fit the change. Damn, amazing! This should be official! 1 note, you should simply swap sprinting and quick summoning instead of what you did now. Same result but less changes. I am really amazed! A simple swap of abilities makes both of them a LOT better! Nice thinking. you did the right thing! I always felt the same way too. these new mages are very much more efficient... but less interessant because they are too adaptated for one unique metagame. Most mages have a very specific, coherent ability set. Johktari would hands down be better and more fun to play with these changes. 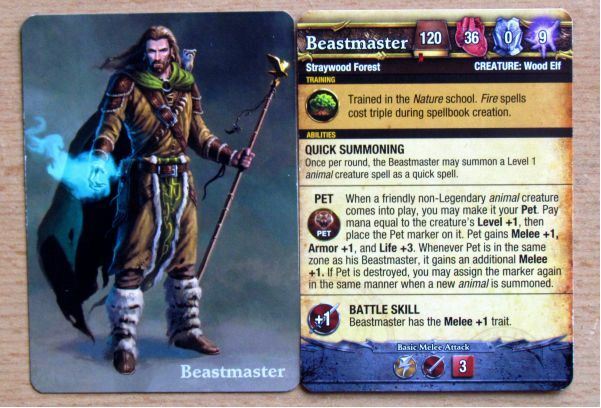 Overall, the straywood would be equally good with the changes, but I have some decks where he would miss the quicksummoning ability. Its nice to be able to quick summon a level 1 pet. Even so, I think the changes are awesome and I will def. try them out.